Camping Domaine Saint Laurent is a 4 star campsite located in La Foret Fouesnant in the Brittany region of France. Camping Domaine Saint Laurent occupies a brilliant location between a traditional Breton creek and the beach, Plage de Kerleven and offers some brilliant sea views. This small yet very well landscaped campsite is built into a hillside which was once a chestnut grove. Luscious green trees, plants and colourful flowers adorn the campsites grounds to give you a real feeling of peace and relaxation. One of the great things about the campsite is that it offers lots for visitors to do In the local area. A short distance from Camping Domaine Saint Laurent you’ll find plenty to keep you busy with lots of fantastic villages, towns and cities to explore, however, if you’re more into nature and the great outdoors you may prefer to walk along the coastal path where you’ll discover a whole variety of inlets, woodlands, coves and beaches. The nearest beach to Camping Domaine Saint Laurent has fine sand along its kilometre length and is perfect for sunbathing, relaxing and having fun. One of the main advantages is that it’s quite sheltered and therefore doesn’t really get much wind which is perfect for families. Kerleven Plage also benefits from having lifeguards in the summer which is a massive bonus. Although there are some fine beaches nearby, Camping Domaine Saint Laurent still provides some fantastic swimming facilities for guests. The on-site water park provides a heated outdoor swimming pool, an indoor heated swimming pool, a children’s paddling pool with water slide, 3 further water slides and a stunning and exciting space bowl slide which is fantastic fun. 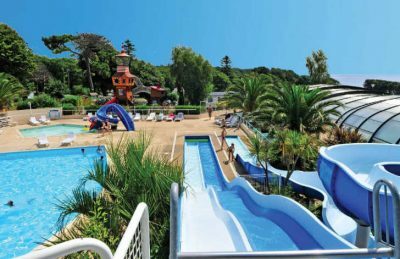 Camping Domaine Saint Laurent campsite offers a comprehensive selection of activities and facilities on site and also nearby to ensure you have a fantastic family holiday. On-site activities at Camping Domaine Saint Laurent campsite include a playground, boules, table tennis, multi sports ground, tennis court, aerobics, football, volleyball, basketball, bouncy castle and mini golf. Facilities available at Camping Domaine Saint Laurent campsite include WIFI, restaurant, takeaway, bar, groceries shop, animation team, games room, tv room, washers and dryers. Accommodation at Camping Domaine Saint Laurent campsite includes a range of 2 and 3 bedroom mobile homes that are available from Brittany Ferries.